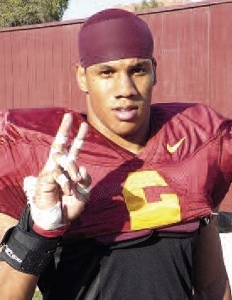 Taylor Mays made an indelible impression on University of Southern California football fans – and unfortunate, unsuspecting opponents – for four years patrolling the defensive backfield for the Trojans. A four-time All-America honoree, the USC safety capped a remarkable collegiate career in 2010 as a second round choice in the NFL Draft – ironically, the 49th overall pick by the San Francisco 49ers. interceptions as the starting free safety in his freshman year. His on-field achievements garnered widespread honors, Mays becoming only the third player in USC history to be named the Pac-10’s Co-Freshman of the Year. He was honored as a second team All-America, first team freshman All-America, and The Sporting News’ Defensive Freshman of the Year. As a sophomore, Mays received The Sporting News first team All-America honors, Associated Press third team All-America, and ESPN The Magazine named him one of college football’s most physically talented players. As a 2008 finalist for the Jim Thorpe Award, Mays led the Trojans as they shut down Penn State in USC’s 2009 Rose Bowl victory. He was named first Team All-America by The Sporting News, Walter Camp Football, and the Associated Press, as well as achieving All-Pac-10 first team honors. Rather than turn professional, Mays opted to finish his senior year at USC – and his on-field accomplishments (a career-high 96 total tackles) earned Mays another round of first team All-Pac 10 and first team All-America honors. The son of former NFL defensive lineman Stafford Mays, Taylor began paying dividends on the 49ers investment in just his fourth professional game – recovering a blocked punt for a touchdown against the Atlanta Falcons. The 23-year-old finished the 2010 season with 31 solo tackles, seven assists and a forced fumble as a frequent starter at strong safety for San Francisco.